Over the past 35 years, I’ve exposed as least as much fraudulent science as any reporter around. That’s just a fact. I mention it, because one would expect I’ve learned a few lessons in the process. Government-backed science exists because it is a fine weapon to use, in order to force an agenda of control over the population. I keep pointing this out: we’re dealing with reality builders. In this case, they make their roads and fences and buildings out of data, and they massage and invent the data out of thin air to suit their purposes. After all, they also invent money out of thin air. Since 1987, one of my goals as a reporter has been to educate the public about false science. Between then and now, I have found that, with remarkably few exceptions, mainstream reporters are studiously indifferent to false science. Official science has a stranglehold on major media. It has the force of a State religion. When you stop and think about it, official science is, in a significant sense, a holy church. Therefore, it is no surprise that the church’s spokespeople would wield power over major information outlets. These prelates invent, guard, and dispense “what is known.” That was precisely the role of the Roman Church in times past. And those professionals within the modern Church of Science are severely punished when they leave the fold and accuse their former masters of lies and crimes. They are blackballed, discredited, and stripped of their licenses. At the very least. Totalitarian science lets you know you’re living in a totalitarian society. We are now witnessing the acceleration of Official Science. Of course, that term is an internal contradiction. But the State shrugs and moves forward. The notion that the State can put its seal on favored science, enforce it, and punish its competitors, is anathema to a free society. For example: declaring that psychiatrists can appear in court as expert witnesses, when none of the 300 so-called mental disorders listed in the psychiatric literature are diagnosed by laboratory tests. For example: stating that vaccination is mandatory, in order to protect the vaccinated (who are supposed to be immune) from the unvaccinated. An absurdity on its face. For example: announcing that the science of climate change is “settled,” when there are, in fact, huge numbers of researchers who disagree. —And then, drafting legislation and issuing executive orders based on the decidedly unsettled science. For example: officially approving the release and sale of medical drugs (“safe and effective”) which go on to kill, at a conservative estimate, 100,000 Americans every year. And then refusing to investigate or punish the agents of these drug approvals (the FDA). For example: permitting the widespread use of genetically modified food crops, based on no studies of their impact on human health. And then, arbitrarily announcing that the herbicide, Roundup, for which many of these crops are specifically designed, is non-toxic. A few of you reading this have been with me since 1988, when I published my first book, AIDS INC., Scandal of the Century. Among other conclusions, I pointed out that HIV had never been shown to cause human illness; the front-line drug given to AIDS patients, AZT, was overwhelmingly toxic; and what was being called AIDS was actually a diverse number immune-suppressing conditions. Others of you have found my work more recently. I always return to the subject of false science, because it is the most powerful long-term instrument for repression, political control, and destruction of human life. As I’ve stated on many occasions, medical science is ideal for mounting and launching covert ops aimed at populations—because it appears to be politically neutral, without any allegiance to State interests. On the issue of vaccines, I’ve written much about their dangers and ineffectiveness. But also consider this: the push for mandatory vaccination goes a long way toward creating a herd effect—which is really a social construction. This “community of the willing” are dedicated to what the government tells them. They are crusaders imbued with group-think. They run around promoting “safety and protection.” This group consciousness is entirely an artifact, propelled by official science. The crusaders are, in effect, agents of the State. They are created by the State. They live in an absurd Twilight Zone where fear of germs (the tiny invisible terrorists) demands coercive action against the individuals who see through the whole illusion. This is what official science can achieve. This is how it can enlist obedient foot soldiers and spies who don’t have the faintest idea about how they’re being used. This is a variant on Orwell’s 1984. The citizens are owned by the all-embracing State, but they aren’t even aware of it. One of my favorite examples of double-think or reverse-think is the antibody test. It is given to diagnosis diseases. Antibodies are immune-system scouts sent out to identify germ-intruders, which can then be wiped out by other immune-system troops. Prior to 1985, the prevailing view of a positive antibody test was: the patient is doing well; his body detected the germ and dispensed with it. After 1985, the view was suddenly: this is bad news; the patient is sick or he is on the verge of getting sick; he has the germ in his body; it does harm. While I was writing my first book, AIDS INC., in 1987-8, I wrote the FDA asking about a possible AIDS vaccine. I was told the following: every person given such a vaccine would, of course, produce antibodies against HIV. That is the whole purpose of a vaccine: to produce antibodies. However, I was informed, patients receiving this vaccine would be given a letter to carry with them, in case they were ever tested for HIV and came up positive. The letter would explain that the antibodies causing the positive test were the result of the vaccine, not the result of “natural” action inside the patient’s body. In other words, the very same antibodies were either protective against AIDS (good) or indicative of deadly disease (bad). This was the contradictory and ridiculous and extraordinary pronouncement of official science. It carries over into every disease for which an antibody test is administered. If a vaccine against disease X is given, it delivers immunity, because it produces antibodies. But if a diagnostic test for disease X reveals the presence of the same antibodies, naturally produced in the body, this is taken as a sign of illness. Extrapolated to a more general level, the Word is: synthetic medical treatment is good; the action of the body to heal itself is incompetent. This is a type of superstition that would astonish even the most “primitive” societies. It no longer astonishes me. I see it everywhere in official science. From the medical establishment’s point of view, being alive is a medical condition. The most useful politicians—as far as official science is concerned—are those who automatically promote its findings. Such politicians are lifted into prominence. They are champions of the Science Matrix. They never ask questions. They never doubt. They never make waves. They blithely travel their merry way into new positions of power, knowing they have enormous elite support behind them. When they need to lie, they lie. They are taught that those who question or reject official science are a tiny ‘demographic’ who can be ignored during election campaigns. ‘Don’t worry about them. They don’t count.’ These politicians are never in the trenches with the people on issues of health. The elite Plan is universal collectivism, in which all citizens are atoms of a giant molecule. Many lies need to be told in order to make that dream/nightmare come true. If some of those lies are about science, so much the better. People believe in science. Think about the agendas behind universal vaccination, climate change, universal psychiatric treatment, GMO food, and other ‘science-based’ frauds. They all imply a model, in which individuals give up their power in exchange for ‘doing good’ and becoming members of the largest group in the world: ‘disabled’ people with needs that must be addressed and satisfied. This program has many agents. Some of them are agents of official science. In these pages, I’ve emphasized that mainstream news often fails to follow up on their own stories. 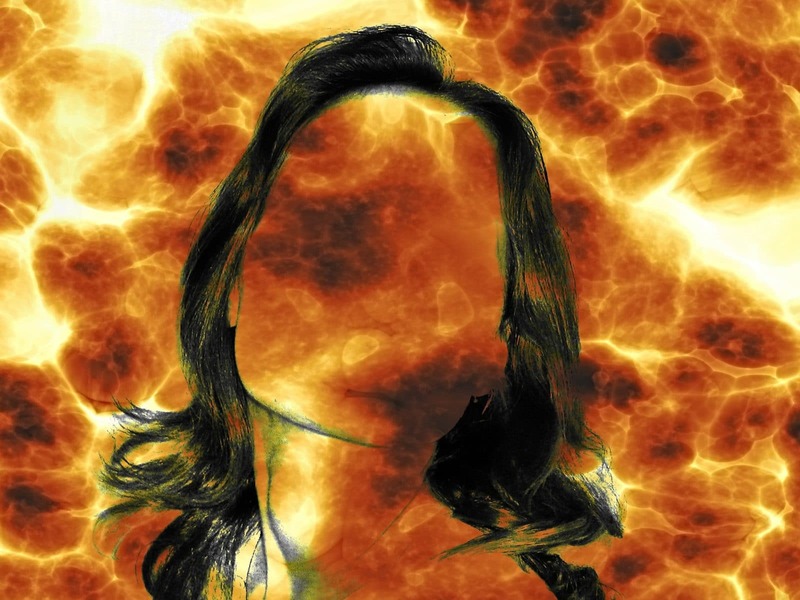 They publish a shocking account of a scandal, and then they drop it like a hot potato. Why? There are several reasons, but the most important is: the scandal is too revealing. It indicts an institution or organization that, in the long run, must be protected. In 2014-15, stories appeared in the press about the phenomenal corruption of the FBI evidence lab. But since then, there has been very little follow-up. I find no compelling evidence that the federal government has fixed the problem. Giant long-term scandal and corruption. The story is covered. Then it disappears. Here is one reason why. If the press outlets continued to search out every aspect of the story, they would come upon numerous prosecutors who routinely relied on false FBI lab reports in trials. Some of those prosecutors would be exposed for knowingly accepting fake evidence from the FBI, in order to make their cases. The scandal would spread like ink on a blotter. Major media news picks their spots. They choose to pound on certain stories day after day, in an effort to convince the public of certain “facts.” They studiously refuse to dig and keep digging on other stories, hoping the public will forget. Journalism schools don’t teach their students that this is the way to do news. After graduating and finding jobs, young reporters catch on. They catch on and go along. That’s how their ideals crumble and disintegrate. That’s how they become agents and blunt weapons for their bosses. That’s how they become alcoholics and denizens traveling through a dim underworld of lies. The notion that a political agenda underlies such scientific pronouncements is unthinkable. So as an example, a very specific example of fake science, let’s look back at the attack on Oklahoma City. On April 19, 1995, one-third of the Murrah Federal Building in Oklahoma City blew up, killing 169 people and wounding 680 others. Three men were arrested and convicted: Tim McVeigh, Terry Nichols, and Michael Fortier. McVeigh was put to death on June 11, 2001, Nichols is currently serving multiple life sentences without the possibility of parole, and Fortier was sentenced to 12 years (he served that term and was released). The official narrative of the bombing stated: A Ryder truck parked at the curb outside the Murrah Building contained barrels of ammonium nitrate plus fuel oil (ANFO bombs), and their coordinated explosion occurred shortly after 9AM on the morning of April 19th. In addition to the deaths and the woundings, the explosion impacted 324 buildings and 86 cars in the area. The vaunted FBI lab decided that, indeed, all the damage and death HAD been caused by ANFO bombs in the Ryder truck. And with those revelations, the case, the investigation, the court trials, and press probes should have taken a whole new direction. But they didn’t. The fake science was allowed to stand. Therefore, other paths of investigation were abandoned. If bombs did, in fact, explode in the Ryder truck, but didn’t cause the major damage, then those bombs were a cover for other explosions of separate origin—for example, charges wired inside the columns of the Murrah Building, triggered at the exact moment the Ryder Truck explosion occurred. Now we would be talking about a very sophisticated operation, far beyond the technical skills of McVeigh, Nichols, and Fortier. Who knows where an honest in-depth investigation would have led? The whole idea of anti-government militia terrorism in the OKC attack—symbolized by McVeigh—was used by President Bill Clinton to bring the frightened public “back to the federal government” as their ultimate protector and savior. Instead, the public might have been treated to a true story about a false flag operation, in which case President Clinton’s massaged message would never have been delivered. But the fake crooked science pushed by the FBI lab was permitted to stand—despite exposure as fraud—and the story of militia terrorists trying to bring down the federal government was allowed to stand as well. The year 1995 was rife with anti-government sentiment in America. This wasn’t merely a bunch of militias talking about insurrection. This was widespread dissatisfaction, on the part of many Americans, who were seeing federal power expand beyond any semblance of constitutionality. Many scared Americans signed on to Clinton’s agenda. And fake FBI science was used to bolster that agenda. Even when exposed as fake by mainstream press outlets—however briefly, with no determined follow-up—the federal brainwashing held. The myth was stronger than reality. If the federal government can egregiously lie about an event as huge as the Oklahoma Bombing, using fake science as a cover—what wouldn’t they lie about? That’s a question which answers itself. 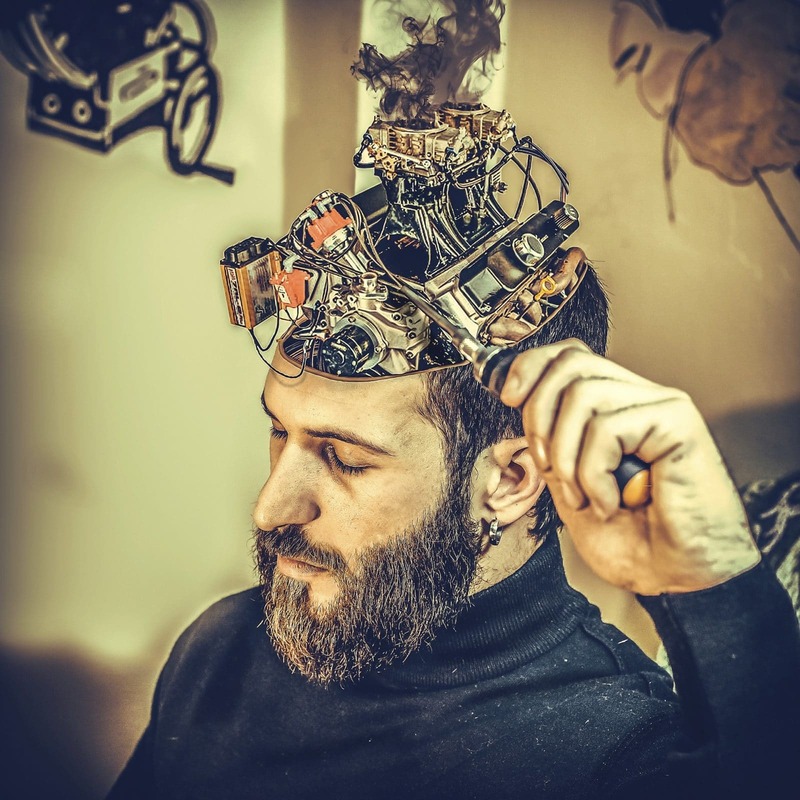 What do you get when you combine behavioural science with big data and use the new Frankenstein hybrid to better influence people’s thoughts, opinions and desires? Why, psychographics of course! Join James today as he delves into the murky world of billionaire hedge fund owners, creepy thought manipulators and the Trump campaign. A couple of days ago I blogged about the discovery of “memory-wiping” enzymes and its implications for the topic of mind control. In that blog, I also made the connection between the mind and the universe, particularly the version of quantum theory called the “multiverse” hypothesis. I’ve long sensed that there is a connection between the mind and matter, and that this connection is not of the tidy Cartesian variety, where the one (take your choice) gives rise to the other. I suspect, and have suspected for some time, that the situation is rather than of a complex set of feedback loops between the two, and that in that situation, that complexity can only be described by something “not physical” in the ordinary, three dimensional sense of our everyday experience. By using an advanced mathematical system, researchers were able to uncover architectural structures that appears when the brain has to process information, before they disintegrate into nothing. In the latest study, researchers honed in on the neural network structures within the brain using algebraic topology—a system used to describe networks with constantly changing spaces and structures. This is the first time this branch of math has been applied to neuroscience. “Algebraic topology is like a telescope and microscope at the same time. It can zoom into networks to find hidden structures—the trees in the forest—and see the empty spaces—the clearings—all at the same time,” study author Kathryn Hess said in a statement. In the study, researchers carried out multiple tests on virtual brain tissue to find brain structures that would never appear just by chance. The findings indicate the brain processes stimuli by creating these complex cliques and cavities, so the next step will be to find out whether or not our ability to perform complicated tasks requires the creation of these multi-dimensional structures. Hess says the findings suggest that when we examine brain activity with low-dimensional representations, we only get a shadow of the real activity taking place. This means we can see some information, but not the full picture. “So, in a sense our discoveries may explain why it has been so hard to understand the relation between brain structure and function,” she explains. Talk about high octane! Let that sink in for a moment: at every moment you are thinking, multi-dimensional structures arise in your very three dimensional brain, and that’s a fancy way of saying your brain is not closed within or upon itself, but is rather an open system interacting with much higher dimensional realities that cannot be encompassed in the material 3-d world. And this is why, using a merely three-dimensional model, or, if I may be more blunt, a merely materialistic model of the mind-brain relationship, has failed to grasp the complexity, the hyper-dimensional complexity, of what is actually going on. Indeed, higher order topologies are necessary to describe thought at all: thought does not occur in the three dimensional material stuff of life solely or exclusively, but outside it, as something coupled with it. (Regular readers of my books will recognize this as what I’ve been calling the Topological Metaphor of the Medium, and its analogical basis.) For those who’ve read my books Secrets of the Unified Field or The Third Way, the name of Gabriel Kron should also spring to mind, with his theory that all electrical circuits, no matter how simple they are, are in effect hyper-dimensional machines, transducing something “down here” from “up there”. What is interesting in this article is also the implication of the object or stimulus of brain activity: for consider what that object is, in physics terms. Even at the atomic or, better, sub-atomic quantum level, these “material” entities dissolve – if I may use that term – into packets of information modeled by multi-dimensional mathematical equations. In other words, multi-dimensionality is the bridge of perception because the multi-dimensionality is at the root of the objects themselves. What’s coming down the pike? Well, I’ve speculated at length about this idea in our numerous members’ vidchats (along with some pretty stimulating speculations from members themselves): the next step is to find the exact nature and structure of those “feedback” loops between the “material” world and the “incorporeal” one: think “quantum neurology” and “neuro-cosmology” for a moment, and you get an intuitive approximation of how the old, tidy, Cartesian dualistic lines are breaking down. We are, I rather suspect, looking at something more akin to the old Neoplatonic spectrum of “fine gradations” from the immaterial world of forms to the increasingly “dense” world of matter. Funny thing, too, to remember that Plato referred to all of this as “the mathematicals”. Funny thing, too, that in membrane theory, space-time is in 11 dimensions. 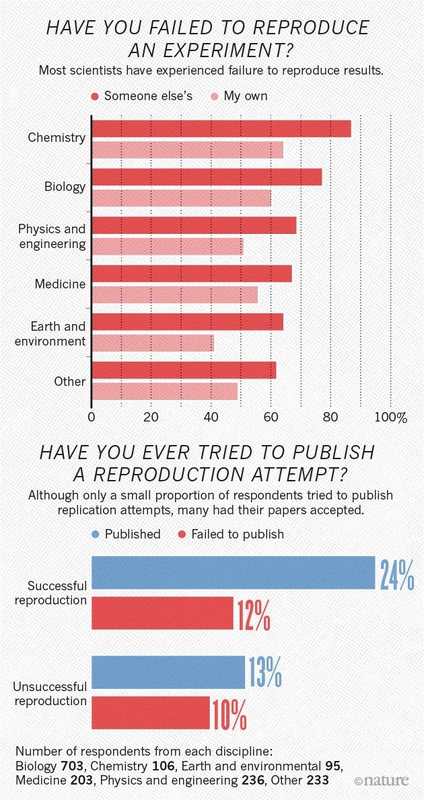 More than 70% of researchers have tried and failed to reproduce another scientist’s experiments, and more than half have failed to reproduce their own experiments. 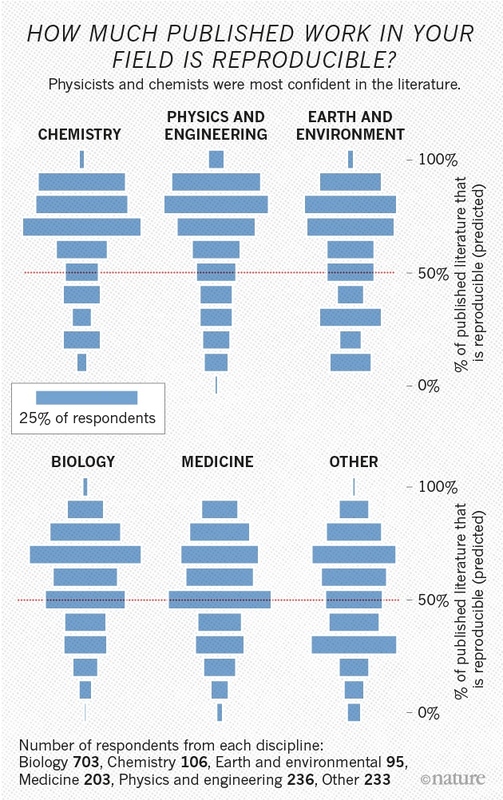 Those are some of the telling figures that emerged from Nature‘s survey of 1,576 researchers who took a brief online questionnaire on reproducibility in research. The data reveal sometimes-contradictory attitudes towards reproducibility. 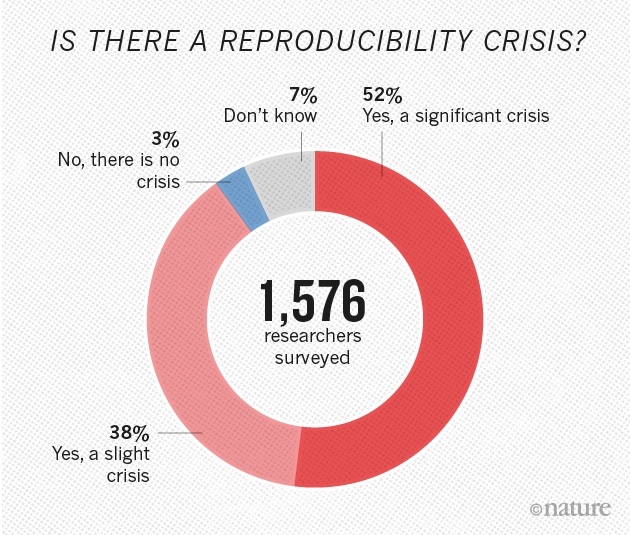 Although 52% of those surveyed agree that there is a significant ‘crisis’ of reproducibility, less than 31% think that failure to reproduce published results means that the result is probably wrong, and most say that they still trust the published literature. Data on how much of the scientific literature is reproducible are rare and generally bleak. The best-known analyses, from psychology1 and cancer biology2, found rates of around 40% and 10%, respectively. Our survey respondents were more optimistic: 73% said that they think that at least half of the papers in their field can be trusted, with physicists and chemists generally showing the most confidence. But sorting discoveries from false leads can be discomfiting. Although the vast majority of researchers in our survey had failed to reproduce an experiment, less than 20% of respondents said that they had ever been contacted by another researcher unable to reproduce their work. Our results are strikingly similar to another online survey of nearly 900 members of the American Society for Cell Biology (see go.nature.com/kbzs2b). That may be because such conversations are difficult. If experimenters reach out to the original researchers for help, they risk appearing incompetent or accusatory, or revealing too much about their own projects. A minority of respondents reported ever having tried to publish a replication study. When work does not reproduce, researchers often assume there is a perfectly valid (and probably boring) reason. What’s more, incentives to publish positive replications are low and journals can be reluctant to publish negative findings. In fact, several respondents who had published a failed replication said that editors and reviewers demanded that they play down comparisons with the original study. Nevertheless, 24% said that they had been able to publish a successful replication and 13% had published a failed replication. Acceptance was more common than persistent rejection: only 12% reported being unable to publish successful attempts to reproduce others’ work; 10% reported being unable to publish unsuccessful attempts. Survey respondent Abraham Al-Ahmad at the Texas Tech University Health Sciences Center in Amarillo expected a “cold and dry rejection” when he submitted a manuscript explaining why a stem-cell technique had stopped working in his hands. He was pleasantly surprised when the paper was accepted3. The reason, he thinks, is because it offered a workaround for the problem. Others place the ability to publish replication attempts down to a combination of luck, persistence and editors’ inclinations. Survey respondent Michael Adams, a drug-development consultant, says that work showing severe flaws in an animal model of diabetes has been rejected six times, in part because it does not reveal a new drug target. By contrast, he says, work refuting the efficacy of a compound to treat Chagas disease was quickly accepted4. One-third of respondents said that their labs had taken concrete steps to improve reproducibility within the past five years. Rates ranged from a high of 41% in medicine to a low of 24% in physics and engineering. Free-text responses suggested that redoing the work or asking someone else within a lab to repeat the work is the most common practice. Also common are efforts to beef up the documentation and standardization of experimental methods. Any of these can be a major undertaking. A biochemistry graduate student in the United Kingdom, who asked not to be named, says that efforts to reproduce work for her lab’s projects doubles the time and materials used — in addition to the time taken to troubleshoot when some things invariably don’t work. Although replication does boost confidence in results, she says, the costs mean that she performs checks only for innovative projects or unexpected results. Consolidating methods is a project unto itself, says Laura Shankman, a postdoc studying smooth muscle cells at the University of Virginia, Charlottesville. After several postdocs and graduate students left her lab within a short time, remaining members had trouble getting consistent results in their experiments. The lab decided to take some time off from new questions to repeat published work, and this revealed that lab protocols had gradually diverged. She thinks that the lab saved money overall by getting synchronized instead of troubleshooting failed experiments piecemeal, but that it was a long-term investment. 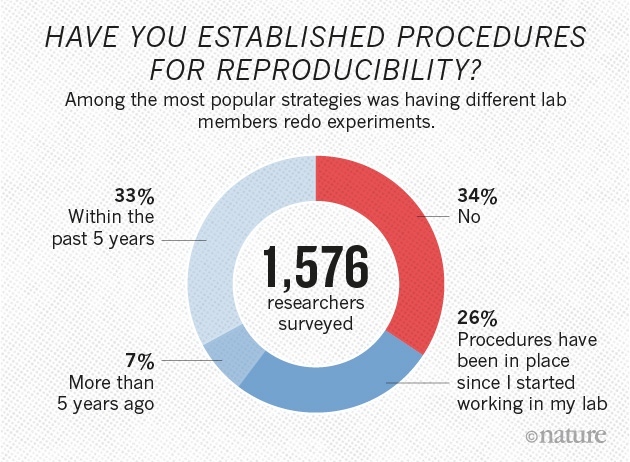 The survey asked scientists what led to problems in reproducibility. More than 60% of respondents said that each of two factors — pressure to publish and selective reporting — always or often contributed. More than half pointed to insufficient replication in the lab, poor oversight or low statistical power. A smaller proportion pointed to obstacles such as variability in reagents or the use of specialized techniques that are difficult to repeat. But all these factors are exacerbated by common forces, says Judith Kimble, a developmental biologist at the University of Wisconsin–Madison: competition for grants and positions, and a growing burden of bureaucracy that takes away from time spent doing and designing research. “Everyone is stretched thinner these days,” she says. And the cost extends beyond any particular research project. If graduate students train in labs where senior members have little time for their juniors, they may go on to establish their own labs without having a model of how training and mentoring should work. “They will go off and make it worse,” Kimble says. 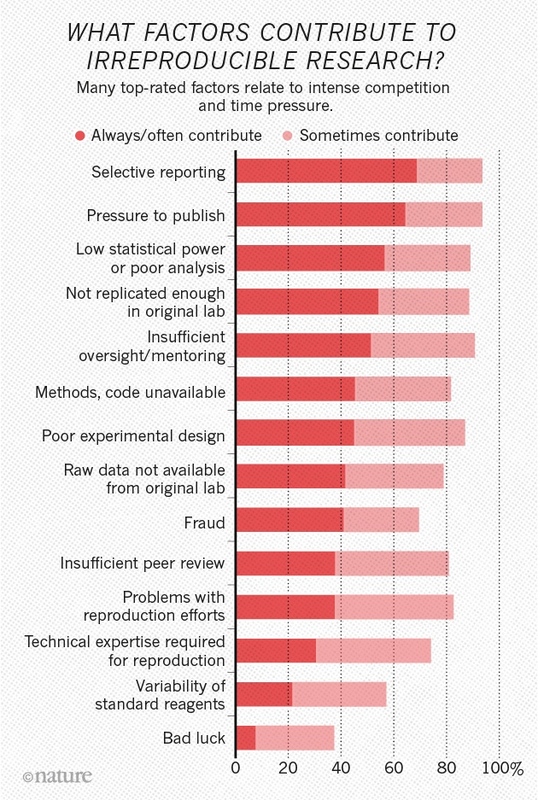 Respondents were asked to rate 11 different approaches to improving reproducibility in science, and all got ringing endorsements. Nearly 90% — more than 1,000 people — ticked “More robust experimental design” “better statistics” and “better mentorship”. Those ranked higher than the option of providing incentives (such as funding or credit towards tenure) for reproducibility-enhancing practices. But even the lowest-ranked item — journal checklists — won a whopping 69% endorsement. The survey — which was e-mailed to Nature readers and advertised on affiliated websites and social-media outlets as being ‘about reproducibility’ — probably selected for respondents who are more receptive to and aware of concerns about reproducibility. Nevertheless, the results suggest that journals, funders and research institutions that advance policies to address the issue would probably find cooperation, says John Ioannidis, who studies scientific robustness at Stanford University in California. “People would probably welcome such initiatives.” About 80% of respondents thought that funders and publishers should do more to improve reproducibility. Just in case you read the title of this blog, and don’t know who Ewen Cameron was, a little history is in order: Cameron was a psychologist/psychiatrist involved in the CIA’s infamous mind-control program, MK-Ultra. Cameron had his “laboratory” in a psychiatric hospital in Canada, where he subjected his victims (I won’t use the word “patients” here, because what Cameron did is in my opinion unspeakable) to a regime of drug cocktails, continual sleep (nor for hours, but for days at a time), and repeated endless bombardment of tape recorders playing back, for hours on end, recorded messages. He called all this “psychic driving,” and his goal was to eliminate “bad personality habits” (or even the personality itself) and to replace it with “something else”, that something else being the recorded endlessly repeated messages. If his “procedures” (and we’ve only very briefly summarized them) sound a little like the Nazi doctors in World War Two, then you understand the measure of the torture he was inflicting. But imagine a magic drug that could do the same thing, without the endless weeks of sleep, tape-recorded looped messages, and cocktails. Indeed, if one digs a little bit into the history of the CIA’s various mind-control programs – Projects Bluebird, Artichoke, or MK-Ultra – one of the things being investigated was precisely the use of drugs for memory and behavior alteration. Scientists have long known that creating new memories and storing old ones involve the creation of proteins in the synapse, where two brain cells meet. For this process to be successful, genes must be expressed in the nucleus of the cell, and this is where a key enzyme can turn genes on or off as new memories are formed. It’s also believed that this enzyme, which is known as ACSS2, plays a role in the memory impairment that is seen in neurodegenerative disorders. In the study, the researchers found that lowering ACSS2 levels in mice reduced the expression of memory genes, thereby stopping the formation of long-term memories. Mice who had reduced enzyme levels showed no interest in a ball they saw the previous day, whereas those with normal levels of the enzyme were interested in the ball. Now the researchers are hoping to use this knowledge to stop traumatic memories from forming in people with PTSD simply by blocking the brain’s ACSS2. This might sound like a good idea to those of us who are haunted by some sort of trauma, but there’s also the potential for this to be used for more sinister reasons. As the article goes on to point out, what’s to prevent the “intelligence” agencies of the modern police state from using the capability to erase memories in individuals (or for that matter, whole populations), it finds “inconvenient”, or from planting completely false memories. In these, Cameron’s goal of completely wiping one personality and replacing it with another come close to reality, without the corresponding torture he inflicted. Which brings us to the high octane speculation of the day: why investigate such things at all? As the article avers, some beneficial uses could be had, but I strongly suspect that all those assurances we were given decades ago from our intelligence agencies during the Church Committee were just that: assurances, nothing more, and that the covert funding and investigation of mind control techniques and technologies continued. With its track record of having given LSD to unsuspecting victims to study their responses – all under the aegis of its mind control programs – one can see where this is going, for in a world where chemicals are sprayed over whole populations without their knowledge (in many cases) and without their consent (in most), it takes little imagination to see that a study of “whole population effects” could be had with the appropriate spraying, or slipping a little “mind wipe enzyme” into a town’s water supply, and watching and studying the results. Indeed, in 1984(note the year) American actor Tim Matheson starred with co-star Hume Cronyn in the movie Impulse, which was about precisely such a scenario. Add a false news story or two and one has a frightening scenario where whole populations might be induced to “remember” something that didn’t actually happen, or to forget something that did. I am reminded of the late 1960s and 1970s, when various gurus of the “drug culture” actually viewed psychedelics are a means of accessing “alternate worlds,” and in a universe where one has quantum physicists emphasizing the role of the observer in the creation of reality, and where they are talking about “multiple worlds” hypotheses, such an experiment might even have cosmological implications. I don’t know about you, but I for one put nothing past them.